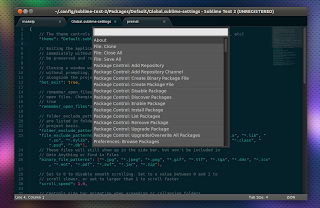 Sublime Text 2 / 3 is an excellent TextMate-like text editor that runs on Linux, Windows and Mac OSX. If you like Sublime Text 2 / 3, you'll love Sublime Package Control, a cross-platform package manager that lets you easily discover, install and update various packages (plugins) for both Sublime Text 2 and Sublime Text 3. Here are some of the plugins that you can install using Sublime Package Control: GIT, Mercurial or SFTP/FTP support, CSS Less (code folding and nesting for CSS), GoTo Recent, HeX viewer and editor, jQuery snippets pack, Vim / Emacs like modelines, SCSS bundle, Open Terminal, JSLint, PowerShell Utils, LaTeX Tools, HTML5 bundle, Zen Coding and many others. Sublime Package Control install and updates the packages via GitHub or BitBucket and the update is done through Git and Hg. Any installed package can be enabled or disabled, you can add custom repositories, create your own packages, etc. If you haven't tried Sublime Text yet, download it from 2 | 3. If you use Ubuntu, there is a PPA you can use: for Sublime Text 2 | Sublime Text 3 to stay up to date with the latest Sublime Text builds. Sublime Text is not free, but you can evaluate it for an unlimited amount of time. Once installed, restart Sublime Text 2 or Sublime Text 3 and press CTRL + SHIFT + P. This should open the Command Pallete which lets you run various Sublime Package Control commands (the Sublime Package Control commands start with "Package Control"); to get started, click on "Package Control - Install Package" and install some plugins you want to use with your Sublime Text 2 installation.